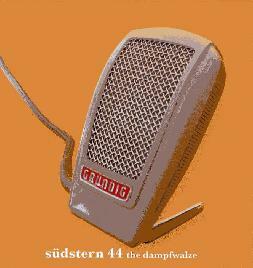 Südstern 44 - "The Dampfwalze"
This is a limited edition CD-R of 100 copies on the new Sulatron Label run by Dave Schmidt (Sula Bassana, Liquid Visions, Zone Six, Psychedelic Monster Jam). The label will release limited edition CD-Rs and other stuff, as well as a cool new mail order place. Anyway, this is described as psychedelic post rock and it is one 67 minute long jam recorded in 2004. It maintains quite a good flow and is best when the groove is heavy and the guitars really kick it up a notch. Sula plays guitar and is joined by another guitar, bass and drums (members of Zone Six and Weltraumstaunen). If you would like to hear one long tripped out track that goes up and down and in and out, then check this one out. Some very good stuff. Oh yeah.. it costs 7€. This band will have a release on Nasoni in October this year. If you dig: Zone Six, Sula Bassana, CAN, Electric Orange, Øresund Space Collective. For more information you can visit the Südstern 44 web site at: http://www.sulabassana.de/suedstern44.